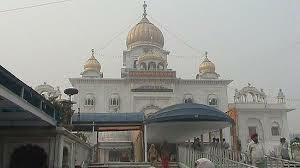 Here is Some Information about Gurudwara Rikab Ganj Sahib Delhi. Gurudwara Rikab Ganj Sahib is located at Ashok Rd, Connaught Place near Parlament House the capital city of India in New Delhi.The Gurudwara Rikab Ganj Sahib is built in 1783 and built by Lakhi Banjara.The Gurudwara is Dedicated to ninth guru of Sikhs Guru Teg Bahadur Ji.The gurudwara complex is home to Delhi Sikh Gurudwara Management Committee.This place came to be known as Rakab Ganj. This tragic death of the Guru and his dedicated companions took place on November 11, 1675 under orders of the Mughal Emperor Aurangzeb. Another devoted Sikh, Bhai Jaita took the Guru ji's head to Anandpur Sahib, 500Km (300 miles) away from Sis Ganj, Chandni Chowk. 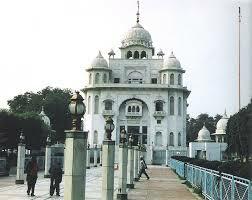 The gurudwara, covered in white marble, looks beautiful. It is one of the most revered Sikh shrines. It has entrances in all the four directions, implying that the gurudwara is open for every person irrespective of any caste or creed. The gurdwara’s large domes have complex floral motifs, and the walls have holy mantras engraved on them. The sanctum that houses the Guru Granth Sahib is ornamented with gold-plated palki. 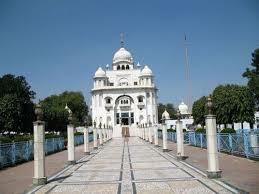 The gurudwara complex boasts of sprawling gardens and well-maintained lawns. During the evenings, the gurudwara gleams with thousands lights, adding to the grandeur of this shrine. Historical records show that Sardar Baghel Singh, constructed a Gurdwara in village Raisina in 1783 to perpetuate the memory of the ninth Guru Sri Tegh Bahadur. He had conquered Delhi by leading an army of 30,000 Sikh warriors along with four other commanders. Before 1783, the Muslims of Delhi had built a mosque on this very spot. The Sikhs claimed this spot as their own sacred place in memory of the sacrifice to their Guru. Muslims contested the claim, and there was strong objection to the dismantling of the Mosque. Rival parties stood with swords drawn and the atmosphere was tense - anything could have happened. However, the Sikhs offered to reconstruct the mosque for the Muslims with their own expense in case the urn containing the ashes of the respected Guru was not found buried beneath the Mosque that stood there. This helped calm the atmosphere and tempers cooled down. The excavation work commenced in the presence of the Mughal officials. The assertion made by the Sikhs proved to be correct and they were allowed to construct Gurdwara Rakab Ganj by Emperor Shah Alam II. He also granted two Sanads to Sikhs. One Sanad granted permission to S. Bhagel Singh to take possession of the land for construction of a Gurdwara and a garden. By the second Sanad, the Emperor also gifted 101 bighas and 5 biswas pukhta equal to about 63 acres with 3 wells land, revenue free. Sikh forces agreed to withdraw from Delhi territory peacefully after the construction of their religious shrines in the Mughal capital in lieu of these concessions. 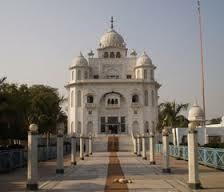 This imposing Gurudwara is made of gleaming white marble that adds to the beauty and serenity of the place. There are large domes adorned with complex floral motifs and holy mantras engraved on the walls of the Gurudwara. The sanctum that houses the Guru Granth Sahib is ornamented with carved gold-plated vault. Apart from this, the Gurudwara premises boast of sprawling garden and well-laid lawns. During the evenings, the Gurudwara gleams with thousands lights that adds to the grandeur of this shrine. The ideal time to visit this shrine is anytime between October to March, as the weather is agreeable during this time of the year and one can enjoy exploring this holy place to the fullest. By Road : There are many public and private vehecals available to reach Gurudwara Rikab Ganj Sahib New Delhi.The main bus terminus is the Inter State Bus Terminus (ISBT) at Kashmiri Gate. Apart from this, there are two other bus depots namely, Sarai Kale Khan and Anand Vihar Bus Terminus. After reaching the bus stand, one can take a public or private bus to reach the Gurudwara.ganj sahib. By Rail : The Nearest Railway station is Delhi railway station. There are three main railway stations in Delhi ,New Delhi Railway Station, Old Delhi Railway Station and Hazrat Nizamuddin Railway Station. After reaching any of these three stations, you can either take a taxi or hire an auto-rickshaw. You can also avail the bus services if you want. By Air : Indira Gandhi International Airport is the main airport here that operates both national and international flights. Once you reach the airport, hire a taxi or an auto-rickshaw to reach the shrine.